MENSANA FEST 2017 is happening in Carlow, Carlow’s Mental Health Festival.The purpose of Mensana Fest is to give people time and an opportunity to reflect on their own mental health. 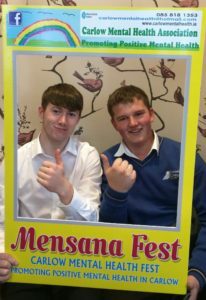 Mensana Fest is organised by the Carlow Mental Health Association and was introduced to our community in Carlow to raise awareness of Mental Health in Carlow. To coincide with MENSANA, Tyndall College celebrated Mind Your Mental Health Week October 9th-13th. Tutor classes over the week, Class tutors spent time getting students to focus on the happy feelings and the positives in their lives, especially the little things. The things that happen in their lives that make them feel happy, that bring a smile to their faces, that make the feel safe and secure, that make them laugh, that they enjoy doing. 6th Year students took part in a Balloon Release, where they spent time writing down their worries and attaching them to the balloons and then letting go of their worries into the sky. Students found this a great exercise to de stress and to think about the positive things that are coming their way while their stresses floated away. 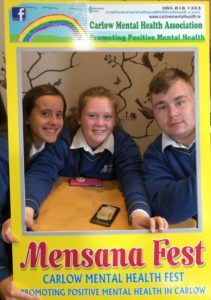 Transition Year students visited the Rainbow Hub cafe as part of Mensana, where the pop up coffee shop was set up to give people a space to talk and connect and raise funds for the Carlow Mental Health Association. A special thanks to Marita Brennan from the Carlow Mental Health Assocation for looking after us with some lovely cakes and plenty of tea. On Friday 13th, 5th Year students took part in Joe Dunny’s Outdoor Fit to Go Bootcamp in Carlow Town Park to release some endorphins and try exercise as a way of enhancing Mental Health. Students really enjoyed taking part and had a lot of fun doing so, thanks to Joe Dunny for making everyone laugh and smile while putting them through their paces!